9/3/17: District elections, Beacon’s, Bikes, Marijuana, and a whole lot more! The pace at City Hall is hopping right now. With the housing plan update, marijuana decisions, district elections, and myriad other things, we’re up to our ears in city business. A former mayor recently said to me that being in elected office is like attending a cocktail party every night. But being the mayor is like hosting a cocktail party every night! The Encinitas City Council unanimously adopted a resolution declaring our intent to transition from at-large elections to district elections. I understand my colleagues and members of the public urging us to fight this — no one likes to be coerced or threatened, especially when faced with unsupported allegations that we’re disenfranchising Latinos with our existing at-large elections. 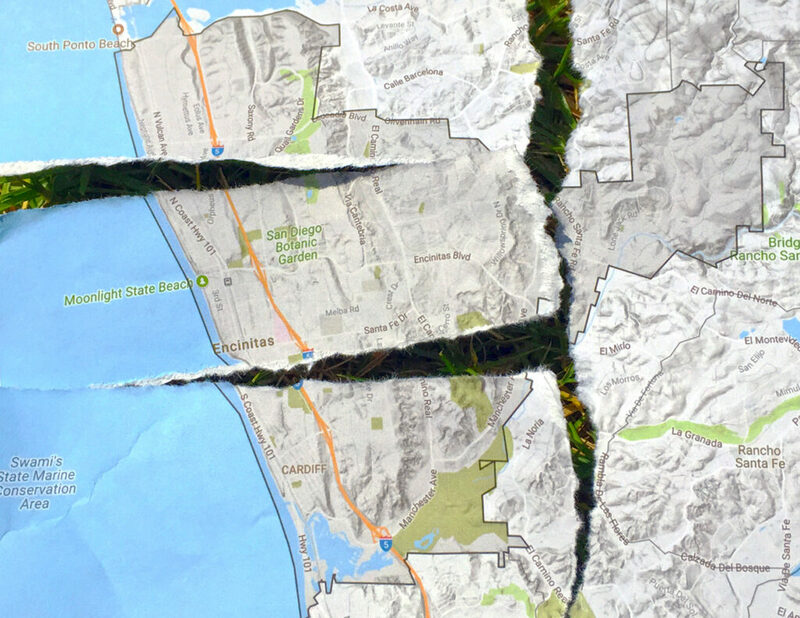 Latinos have served in elected and appointed offices in Encinitas; and there isn’t any evidence that Latino residents are unable to elect candidates of their choice to the City Council. But this decision, unfortunately, isn’t about the actual merits of the issue. The question is whether we want to spend at least a million dollars and likely several million dollars to be the test city in a legal fight under the California Voting Rights Act. No city has won a case under this act. Only one city – Palmdale – has gone to trial on the merits, and they lost. At least 150 school districts, 28 community college districts and more than 60 cities have switched or are currently switching as a result of litigation threats because they believe there are better ways to spend a couple million dollars. And I believe that the city’s failure to have adequate zoning for what’s considered “affordable housing” is a black eye and a liability for the city in any lawsuit claiming discrimination. This significant fact would certainly be seized upon by the plaintiffs in litigation. Importantly, if we were to fight it and win, we would still pay all our own attorney’s fees and costs. If we lose, we pay their fees as well, including the cost of expensive experts and demographic studies. The basic reality is that every one of us has limited time, energy and money. If we decide to fight this, we are prioritizing this issue over other projects. I believe we should spend our city’s energy, our critical personal capacities, and taxpayer money in ways that align with our city’s priorities, not on being the test case for a Voting Rights Act lawsuit. I think our current election system works well, but that doesn’t mean that another governance structure – like City Councilmembers elected by district – can’t work, too. Based on the Council’s action last week, we’ve entered a 90-day safe harbor period, during which the plaintiff can’t file a lawsuit against us while we get busy with districting, according to certain requirements. We’ve scheduled a special meeting at City Hall at 6 p.m. this Wednesday, September 6. Fascinating details are here in this PowerPoint presentation that will be shown at the meeting. And here’s a link to all the information on the city’s website, including the schedule of meetings. The San Diego Union-Tribune story is here; the Coast News story is here and the Encinitas Advocate story is here. These part-time positions, costing $28,800 each, are a great solution and cost effective, especially compared to the alternative of hiring one new code enforcement officer for up to $103,943 a year, or a full-time deputy for substantially more. The retired deputies will work two or three nights a week until at least 2 a.m. doing inspections, responding to complaints received on the hotline in real time, doing community outreach and other necessary tasks. I’m really happy that our innovative staff came up with this narrowly-tailored, flexible solution that can be easily altered if necessary. And in related news, the Planning Commission’s recent 3-2 approval of a Modern Times beer tasting room that would seat 150 people, across from La Paloma movie theater in downtown Encinitas has been appealed to the City Council, with a current appeal date of October 11. Here’s the Encinitas Advocate story when the tasting room was approved. Longtime Leucadia resident and surfer Darius Degher checks out the Labor Day weekend scene at Beacon’s Beach. The crumbling bluff, switchback trail and parking are slated to be improved, pending Coastal Commission approval. In an impressively speedy pivot, the city staff responded to our recent request for a Beacon’s Beach plan that could receive regulatory approval by presenting us with a solution this week that the Coastal Commission and Surfrider have indicated is headed in the right direction. The project involves a stairway, a series of landings on the bluff and beach, and a partial relocation of the parking lot eastward, away from the unstable areas of the bluff. There are currently 27 parking spots at the top of Beacon’s Beach, and up to 10, but hopefully fewer, parking spots may be lost based on the reconfiguration. We will try to keep as many parking spots as possible because we know this is a popular beach access area. We authorized a contract for up to about $700,000 for this project’s design, construction plans, environmental documentation and permits. It’s gratifying to have the city staff implement a solution so quickly after hearing City Council feedback. Many neighboring cities have substantially and dramatically improved their use of public road space to accommodate biking and walking. For example, if you drive through Del Mar, Solana Beach or Carlsbad, you’ll notice bike lanes dedicated with green paint, buffers indicating where car doors swing open, visible signage, curb pop-outs that reduce the distance that a crossing pedestrian is exposed in the middle of a street, and many other improvements. Recent notable street improvements include Camino del Mar and Jimmy Durante Boulevard north of downtown Del Mar and Stevens Avenue in Solana Beach near Earl Warren. These updated street design standards come from multiple sources; one of them is the National Association of City Transportation Officials (NACTO) Urban Street Design Guide and NACTO Urban Bikeway Design Guide. The City Council recently requested that city staff incorporate these guidelines after they were suggested by Active Transportation Specialist Dan Burden, whom we hired to evaluate improvements to El Camino Real. The design guidelines have been endorsed by Caltrans as an additional tool for constructing transportation systems that better support pedestrians, bicycles, and automobiles. One of my most vexing problems in public office has been trying to accomplish substantial mobility improvements in Encinitas. I’m admittedly frustrated by the slow pace. We have high-level documents that express mobility as a community value; we have dedicated city resources to these projects and we routinely spend large amounts of City Council time devoted to the micro-analysis and discussion of street improvement projects. The elected officials have suggested lots of ideas, including a bike lane protected by a physical buffer somewhere in the city, possibly along Coast Highway in Cardiff between Solana Beach and restaurant row, where speeds are fast and there aren’t any driveways that create cross-traffic; improvements to the signage and striping of the bicycle sharrows along Highway 101; a bicycle “lorax” or ambassador who rides our streets on a bike and addresses problems with street sweeping, trash, signs and tree trimming that limit bike utility; improvements along El Camino Real and around local schools, among many other suggestions. So effort is being expended. But results are the measure of success, and we haven’t yet made the type of road improvements that create an Encinitas community where it is more pleasant or safe on a bike. With the right training and initiative, Encinitas could be a leader in this area. So I was thrilled to see a request from city staff last week for $10,000 to pay for staff training by the NACTO organization in the design tools and tactics that will help transition and integrate our existing approved public-roads standards to these NACTO guidelines. Change is not coming easily or quickly here but I remain committed to improved mobility as a top city goal and won’t settle for maintaining or slightly improving the status quo in this area. I’m hopeful that improvements to our city process will enable us to meet these goals in a more direct and streamlined way. Speaking of mobility, the Cardiff Beach Living Shoreline project is a shining Encinitas success story. The project will create sand dunes and install a pedestrian trail on the west side of Highway 101 in Cardiff between Solana Beach and restaurant row. This week we accepted a $2 million grant from the California State Coastal Conservancy, who told us that this demonstration project is being closely watched statewide. City Program Administrator Kathy Weldon deserves our thanks and appreciation for her vision and diligence in creating this project’s success at very little cost to the city. The next and likely last marijuana subcommittee meeting is scheduled for September 28th at 6 p.m. at City Hall. I continue to hear strongly held and widely divergent views on what the city’s role should be in the middle of this contentious and evolving social issue involving marijuana cultivation and distribution in Encinitas. If you would like to add your voice to the process, please attend! Our next Housing Element Task Force meeting is Sept. 5th at 5 p.m. at City Hall. Again, this is your chance to weigh in. Here are the meeting materials. One of the things that I love about my work as your mayor is the highly engaged nature of it. Every week I’m deeply involved, working to help create positive improvements in our city. It can be intense, and sometimes frustrating, but the rewards are immense and I’m constantly learning and hopefully becoming a better mayor for you, the people I serve. 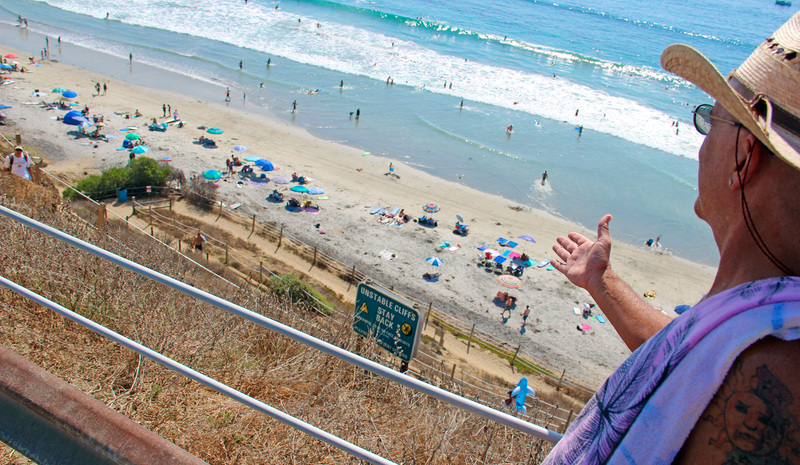 For the most part in Encinitas, the level of civility and residents’ engagement is gratifying. Thank you for participating in our local issues! I hope you and your family have a restful and memorable day off! Last weekend’s LeucadiART Walk event was a tremendous success. 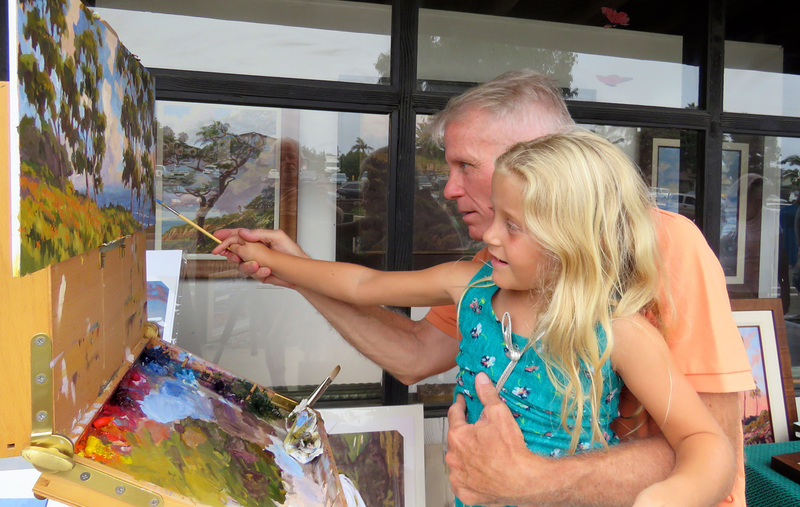 In this photo by Morgan Mallory, Jim McConlogue is plein air painting eucalyptus trees in front of Leucadia Art Gallery and Corner Frame Shop. The young art appreciator was very happy to add a few strokes.